What you're looking at here is the zoomiest point-and-shoot camera ever made. 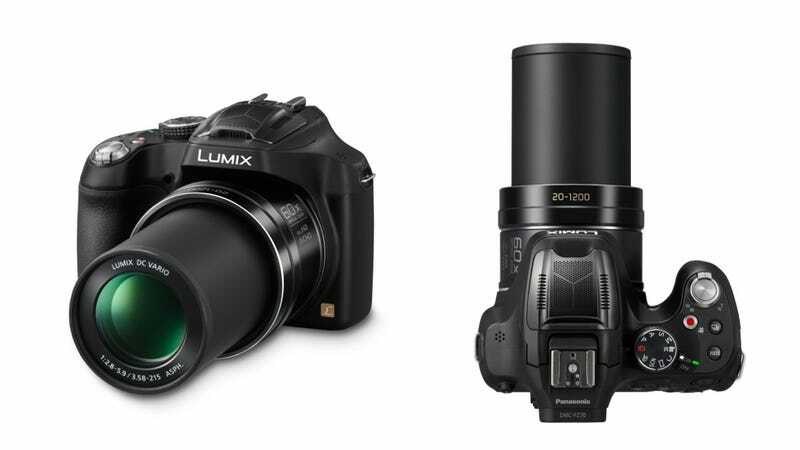 The Panasonic Lumix DMX-FZ70's f/ 2.8-5.9, 20-1200mm lens offers up to 60x optical magnification. The previous top zooms only hit the 50x mark. That's a lot of zoom. Look at that freaking lens. Optical zoom—meaning zoom that's done in the lens and not by some digital trickery—is a huge selling point for point-and-shoot cameras. As the image sensors in smartphones get better, a very long optical zoom is a feature that's still attractive to ordinary people. It's the quintessential tourist and family gathering feature. Beyond their lenses, regular people like superzooms because they've got some of the look and feel of fancy DSLR cameras without actually being expensive and heavy like a DSLRs. This FZ70 is no different: It's got a comfortable grip, a viewfinder, and even a mode dial with manual exposure settings in addition to the usual flavors of Auto. At 1.5 pounds, it'll hardly be a strain on anyone's neck as they amble about a foreign city.